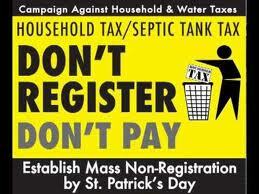 Hundreds of people took to the streets in Newbridge, Co. Kildare – estimates ranged from 250 to 500 – on Saturday, February 25 to protest against both the household tax and the septic tank tax. “Don’t register, don’t pay,” was the message delivered by both the banner leading the march and the chanting of the marchers. The protest went to local Fine Gael TD Martin Heydon’s office, although Heydon himself wasn’t there. The Campaign Against the Household and Water Taxes in this area is made up of local residents, trade unionists and members of éirígí, the Workers Solidarity Movement, the Workers Party and the People Before Profit Alliance. 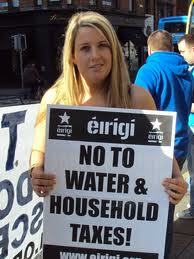 Over the last number of weeks éirígí Ballyfermot has been centrally involved in establishing the Campaign Against the Household and Water Taxes in Ballyfermot, Chapelizod and Inchicore. Campaigning is ongoing on an almost daily basis and includes postering, leafleting, canvassing door to door, campaign stalls and local meetings. 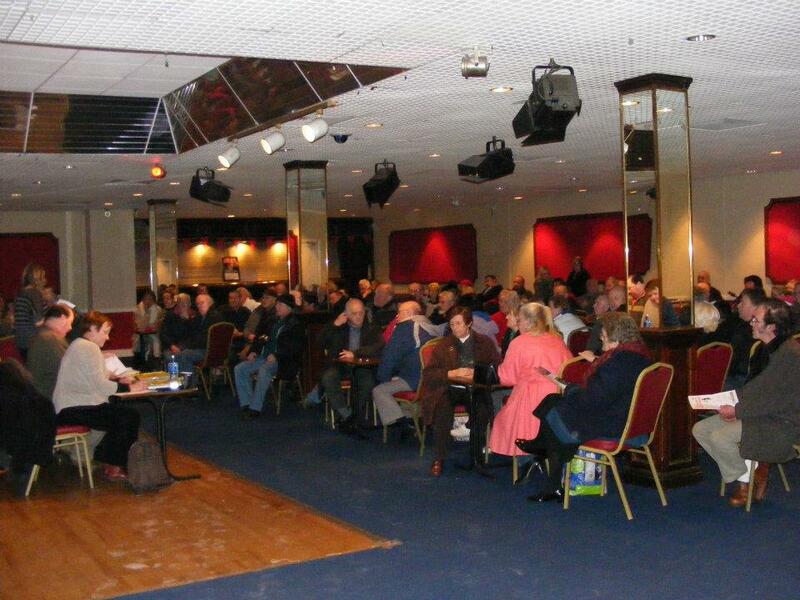 Tallaght éirígí spokesperson Scott Masterson has said that the enthusiasm displayed at recent anti-Household Tax meetings in Fettercairn and Killinarden is deeply encouraging. The socialist republican party’s spokesperson was speaking after addressing the meetings in Fettercairn and Killinarden community centres. Masterson said, “The campaign against this unjust and immoral tax is only beginning. From what I have seen at the meetings in Fettercairn, Killindarden and across Tallaght it is clear that a large amount of people are joining the boycott of the household tax. 10. 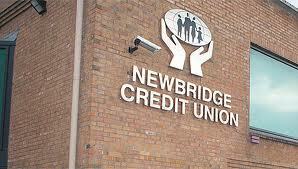 What’s behind the attack on the Newbridge Credit Union? 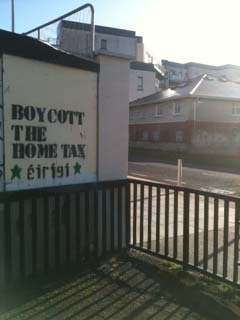 Budget 2012 saw the Dublin government confirm its intention to impose a poll tax on homes across the Twenty-Six Counties. And so with the stroke of a pen the Fine Gael/Labour coalition levied yet another ‘stealth’ tax on in excess of 1.5 million homes across the state. From January 1st 2012 the flat fee of €100 has been imposed on all eligible homes regardless of the income, employment status, wealth, age or number of dependents of the homeowner. In other words a billionaire living in a mansion will pay the same as an unemployed person living in a flat. Regressive taxation of this sort places an unfair burden on poorer households, resulting in deeper inequality in an already deeply unequal society. While the Dublin government have attempted to sell the new home tax on the basis of it costing ‘only €2 a week’, even they admit that that figure will rise steeply over the coming years. Current plans will see a ‘site evaluation based property tax’ and domestic water tax replace the €100 home tax in 2013/2014. It has been estimated that the average household will face a combined property and water tax bill of somewhere in the region of €1000 to €1500 per year by 2014. It is also clear that very few households will be afforded a waiver from these new taxes when they come into full effect. 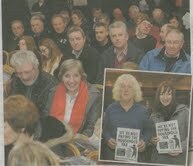 Comments Off on Boycott the home tax! By the end of 2013 the southern Irish state and the EU will have closed 130 bogs across the 26 counties, designating these raised bogs as Special Areas of Conservation (SACs). In effect they will prevent families and domestic turf cutters from cutting turf as they have done for hundreds of years. The EU Habitats Directive was introduced fourteen years ago; yet the Dublin government’s inaction has been palpable with little or no consultation by the previous government with those affected. The belated action has been the introduction of a scheme for affected landowners and people with turbary rights, offering compensation of €1,000 a year for up to 15 years or, if possible, the transfer of their cutting to other bogs which are not SACs. The compensation seems grossly unfair considering it more than likely won’t cover the annual cost of another fuel, let alone the installation of a new central heating system, so fuel poverty is a reality. On Friday 15th January the High Court appointed Luke Charlton, Partner at Ernst & Young, as Special Manager to Newbridge Credit Union. 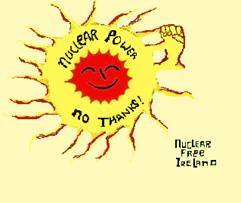 At that hearing the board was silenced by the High Court under pain of a fine of €100,000 and/or a three-year jail term. They were not allowed to speak with the workers, the members, the media or the public. I cannot understand why the same rules did not apply to the Central Bank, the Regulator and Dept. of Finance, one of which broke the news to KFM as Luke and his 11 suits marched into the Credit Union. The Directors were given seven days to appeal this decision. What is most interesting about the actions of the Central Bank is the law that was chosen to investigate this perceived problem in Newbridge. This is the first time that Commercial Company Law has been used in this manner. There are sections of the Credit Union Act which could have been used by the Regulator or the High Court to examine Newbridge Credit Unions books.